This versatile tire merchandiser lets you show the tire sidewalls on the top, while the tread designs show on the lower tier. 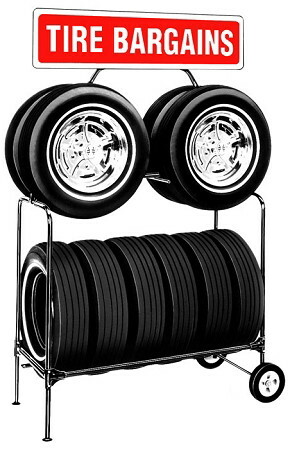 - Use display wheels or tire centers in the upper tires for an even better appearance! - Rolls easily on 8" semi-pneumatic wheels when coupled with a No. 1898 Tote Jack - "Get Our Deal!" or "TIRE BARGAINS" signs available in stock. Custom brand or logo signs available, contact us for quote.